A goat that has been wandering around the eastern Missouri town of Mexico has gained enough attention to have his own Facebook page. But animal control officers are not amused. 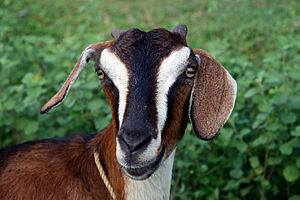 KXEO reported that the goat was first seen by a motorist on Saturday near an underpass on the east side of town. Mexico animal control officer Joe Horton said the department has received more than a dozen reports of the adult goat being seen around town, including in downtown Mexico. via Wandering goat in Missouri gets Facebook fan page – Yahoo! News.